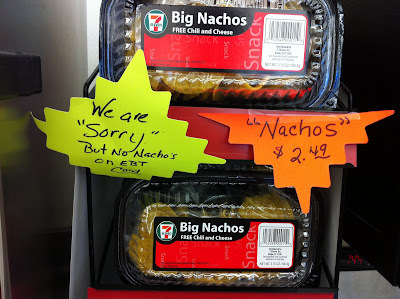 The “Blog” of “Unnecessary” Quotation Marks: "sorry" about the "nachos"
They seem uncertain whether or not these things should be called nachos or not, so I guess it's ok if they aren't really sorry you have to spend your EBT on something more closely resembling food. Thanks, Abigail. There's an unnecessary apostrophe on the left sign, just for balance. Like Doctor Tarr said, the real "issue" what Nacho's stuff comes with it that makes them ineligible for EBT.